Rasmussen's encephalitis is a rare autoimmune disease that primarily affects children and can lead to seizures. As the disease is resistant to drug treatments, it frequently requires surgical interventions to remove or disconnect the affected part of the brain. 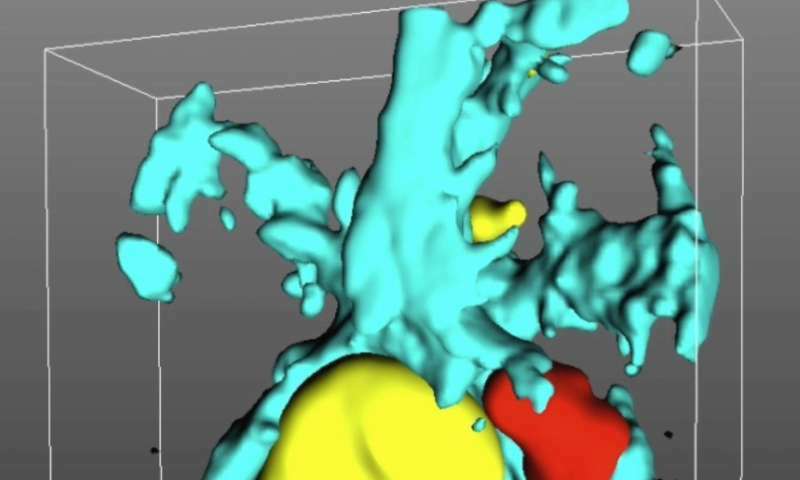 Researchers from the University of Geneva (UNIGE) and the Geneva University Hospitals (HUG) have succeeded in describing and mastering the mechanisms at work within neurons in mice, opening the way to possible treatments. It was previously thought that neurons were the target of immune system cells that attack synapses, the connections between neurons. But researchers have discovered that the neurons themselves play an active role in triggering this process. Their research is published in Cell. In Rasmussen's encephalitis, as in other forms of encephalitis, the presence of an antigen in the affected neurons triggers an immune system response, resulting in synaptic alterations. A team of researchers led by Doron Merkler, associate professor in the Department of Pathology and Immunology at the UNIGE Faculty of Medicine and senior consultant in the Clinical Pathology Service of the HUG, was able to show that neurons are not passive victims of this attack, but instead play an essential role in triggering a defence mechanism that ultimately leads to their own damage. 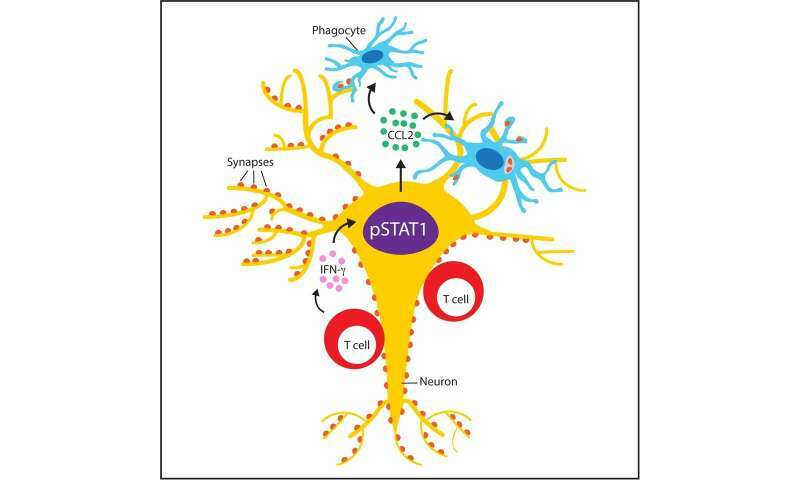 "Following the attack by CD8+ T lymphocytes of the immune system, which fight against viral infections, the neuron produces a chemical signal to other cells called phagocytes which then attack the synapses. It's a sort of tripartite tango with tragic consequences," explains Doron Merkler. Triggered by the neuronal antigen, CD8+ T lymphocytes release a protein, IFN-γ, captured by a corresponding neuronal receptor. Subsequently, neurons activate the STAT 1 signaling pathway, which leads to the production of a molecule called CCL2. This molecule diffuses into the neuronal environment, where it activates other immune cell types called phagocytes—these are microglial cells present in the brain and macrophages derived from blood circulation. These two types of phagocytes finally attack the synapses. "If we manage to cut off the signal emitted by the neuron, this whole cascade of causes and consequences could be blocked," says Giovanni Di Liberto, researcher in the Department of Pathology and Immunology at the UNIGE Faculty of Medicine and first author of the study. A similar signaling signature could also be found in biopsies performed in more than 20 patients suffering from Rasmussen encephalitis, and researchers advocate that it is possibly identical for other forms of encephalitis. In mice experiments, this mechanism has been successfully blocked at different levels: The UNIGE and HUG teams have thus succeeded in blocking the signaling pathway of STAT1 and CCL2 molecules, as well as the migration and activation of phagocytes by pharmacological interventions and genetic manipulation, avoiding in all these cases the degradation of synapses and allowing for a better control of the disease. Researchers will now have to partner to pursue the development of a possible treatment and conduct the necessary clinical trials, a difficult task when it comes to rare diseases. "But the principles we are describing are probably at work in other diseases that cause a strong immune response, and may even play a role in multiple sclerosis," says Merkler. Now, WHY would any CELL turn against itself? Think about it.